In 1994 Vienna’s famous MAK (Austrian Museum of Applied Arts/ Contemporary Art) extended its reach abroad by creating the MAK Center for Art and Architecture Los Angeles. It is housed in three architectural landmarks designed by Schindler and continues his legacy by serving as a think tank and a laboratory for advancing new ideas of 21st century art, design and architecture. As the Director of MAK Vienna, Peter Noever, founder of MAK Los Angeles, explains: “The MAK Center in Los Angeles represents more than a museum of special interest exhibiting the work of Schindler that became the prototype of California design. It is a center for internationally-coveted scholarship programs which incorporate, promote and continue Schindler’s vision and ideas.” The MAK Artists and Architects in Residence Program with 140 participants to date (since 1995) has a strong impact on the world of art and architecture. Interdisciplinary in nature, the residency programs combine architecture, art, social and environmental concepts of urban theory, attracting students from throughout the world. Following completion of the program, many valuable lifetime networks have been established. As a pioneer, Schindler created and lived in a social utopia dedicated to experimentation and this spirit is carried on today by MAK’s residency programs. Born in Vienna in 1887, Rudolph M. Schindler attended the Imperial Technical Institute of Vienna and trained as an engineer. He was also concurrently enrolled in the prestigious, Vienna Academy of Arts and it was during these years, that Schindler absorbed the teachings of Otto Wagner and was introduced to the applied arts of Josef Hoffmann and the theories Adolf Loos. Through these figures, he was exposed to the ideas of the late 19th and early 20th century Arts and Crafts movement of the Wiener Werkstätte. In 1914, encouraged by Loos’ enthusiasm for the innovative ideas emanating from the United States, Schindler left for America and worked under the profound influence of Frank Lloyd Wright. He was convinced that Wright was the only one of the moderns representing an essentially creative viewpoint. Supervision of the construction of a group of structures designed by Wright took him to California, where in 1921 he eventually established his own practice in Hollywood/Los Angeles. He remained there throughout the 1920s, the Depression and the war years of the 1940s until his death in 1953. He was convinced that the West with its spaciousness and open approach to new ideas allowed him to develop and welcomed an architect with dreams of a new architecture that would replace the turning of the tide on ‘functionalism’ in architecture which was the outgrowth of militarized post-war Europe. His own home, a structure he built in 1922, represents an early experimental example of that dream and serves as a masterwork that helped establish him as a major figure in the history of modern architecture. Schindler’s studio residence, a live/work space for two families, remains to this day an outstanding example of his theories: It redefines the notion of space, having no living room or dining room or bedrooms. Its main features are a one-story construction with horizontal planes, built low to the ground with wide expanses of glass and walls with large sliding doors opening to a garden. It has prefabricated wall units, a flat roof and movable partitions for flexibility which have become a standard for modern architecture and a prototype for a distinctly California-style of design. 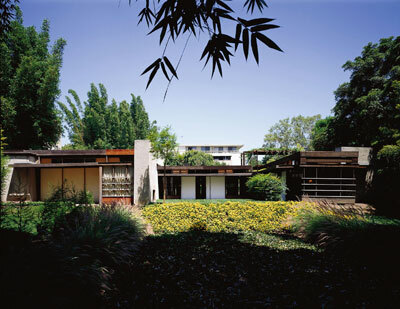 After the death of Schindler in 1953, his wife Pauline left the residence in the Schindler family until FOSH (the Friends of the Schindler House) purchased the property in 1980. They then signed an agreement with MAK Vienna to create the ‘MAK Center for Art and Architecture in Los Angeles’ in 1994. The agreement allowed the Friends of the Schindler House to retain ownership while MAK assumed responsibility for financial obligations and programming. Today the MAK Center in Los Angeles, as a satellite of MAK Vienna, is partially funded by the Austrian Federal Ministry of Education, the Arts and Culture. Formed in 1994 through the initiative of Peter Noever, the MAK Center in Los Angeles is an extension of the approach developed by MAK Vienna, international in scope, focusing on experimentation and carrying on Schindler’s legacy of promoting art and architecture. The completely renovated Schindler House (1922) serves as a forum for continuous cultural exchange between Vienna and Los Angeles. It is unique in that it provides a place for exhibits. Following the tradition of Schindler and his wife who had made the house a center for avant-garde artists and intellectuals in the 1920s and 1930s, MAK Los Angeles has become a center for today’s artistic community. It attracts diverse audiences and produces a year-round schedule of exhibitions, lectures, concerts, film screenings, performances, publications and the commissioning of new works. The Mackey Apartment House (1939), purchased by the Republic of Austria in 1995, is a permanent residence for artists and architects in the bi-annual residence program hosted by the MAK Center. Internationally one of the most sought-after scholarships, the residency program selects eight young international artists and architects from abroad to live and work in L.A. for a six-month period. Residents are selected competitively by a jury for MAK Vienna. Each resident is given an apartment in the Schindler-designed Pearl Mackey Apartments, a monthly stipend and the support of MAK Center’s staff. Each session concludes with an exhibition of individual projects, which are documented in the archives of the MAK Center (www.makcenterarchive.org). In a recent announcement on June 4, former owner Russ Leland donated the Fitzpatrick-Leland House (1936) to MAK Center Los Angeles. Leland bought it in 1990 and spent years restoring it to its original design. As noted by Peter Noever, “This is a special step in the history of MAK Center, which we founded fourteen years ago. Rudolph Schindler designed this as a “spec” house for a real estate developer to attract people to the area. As the new home of MAK Center’s Urban Future Initiative (MAK UFI), the house functions in much the same way: now we will attract the people who will design the future.” The program grants two-month residencies to researchers from around the world who are exploring urban issues such as sustainability, immigration and social justice. “With this new fellowship program focusing on urban issues, we are in a stage of expansion not only physically but also conceptually, reaching out not only to the LA area and Europe but also to the whole world in terms of this new initiative,” as Kimberli Meyer states. The first round of the fellowships began in April 2008 and is funded through September 2009. They will bring seven fellows to the facility, the first of whom was an architect from Indonesia. With its Schindler Initiative MAK has brought an Austrian cultural institution of international standing to the United States. Today MAK Center Los Angeles is well accepted in the Los Angeles community and occupies a very important niche. As Director Meyer explains “there is no organization that is quite like us that unites its synergies so much between art and architecture. We are as involved with the contemporary architecture community as we are with contemporary modern art community.” Its location in L.A., with its Asian and Latin American orientation, has given the MAK Center international relevance. As an Austrian project focused on exchanges of artistic activity, it has had an important retroactive effect on Austrian culture by bringing the spirit of L.A. back to Vienna. This historic connection between MAK Vienna and MAK Los Angeles is one of the most effective and least speculative ways that Austria represents itself in the international community. Established in 1863, after long efforts by Rudolf von Eitelberger (the first Director of the later “MAK”), as the Imperial and Royal Austrian Museum of Art and Industry by Emperor Franz Josef, the MAK – Austrian Museum of Applied Arts/Contemporary Art, underwent multiple changes throughout the late 19th and early 20th centuries. After establishing its current location on Stubenring in the building based on plans of Heinrich von Ferstel in 1871, MAK included the School of Applied Arts Vienna (now University of Applied Arts), which was founded on the idea of combining theoretical and practical training. It was the first institution of its kind on the European continent and provided a training ground for young artists such as Gustav Klimt, who paved the way for the progressive Secession movement. In its wake came the breakthrough to Modernism with artistic personalities such as Otto Wagner, Felician von Myrbach, Koloman Moser, Josef Hoffmann and Alfred Roller, establishing the school’s global reputation. In 1986 Peter Noever was assigned the Director of the MAK and with him, the museum’s collection and building itself was intervened by contemporary art and throughout the years continued to receive international attention. Since then MAK’s current identity was created and a fundamental agenda, bold and decentralized, was introduced. One of the significant elements of the restructuring included the exhibition design for the presentation of objects determined by the interventions of contemporary artists. The development of new display strategies for the permanent collections reorganized formal modes of presentation, allowing an unparalleled interplay of historicism and contemporary intervention. Artists involved with re-presenting historical artefacts have included Barbara Bloom, Eichinger and Knechtl, Günter Förg, Gangart, Franz Graf, Jenny Holzer, Donald Judd, Peter Noever, Manfred Wakolbinger, Heimo Zobernig, Sepp Müller, Hermann Czech, and James Wines/SITE. Transforming a World War II anti-aircraft tower in Vienna’s Arenbergpark, the Contemporary Art Tower (CAT) will be an international center, showcasing important contemporary projects. Through its unique avant-garde architecture and pioneering program, this “monument of barbarism” will become Vienna’s foremost venue for contemporary art. The museum will continue to develop as a place of awareness, free of external influences, by advancing the discourse between the interplay of experience and perception. Since it navigates along the borders that separate art and awareness from innumerable forms of fashionable consumption, the museum’s articulation of qualitative assessment makes it a central forum for resistance against the widespread loss of meaning pandemic in contemporary popular culture.